I do love a good pie, but if the pie crust isn’t quite right it spoils the pie for me. When I was in college I worked as a waitress in a little cafe. One of the items on the menu was pie. The woman that made the pies could not make a pie crust if her life depended on it. They were always too thick and tough. Nobody ever ate them; they would eat the filling and leave the crust behind. Now my mother on the other hand is a master at making pie crust. Her crust always turned out nice and flaky. So it is a good thing that I had her to teach me the art of making a pie crust and not the lady at the little cafe. The carb person that I am thinks that the pie crust is one of the most important things to the pie. These days I am always on the look out for new ideas when it comes to pie crust. The more flaky and tender the better the pie. I was at our public library looking for a new recipe on pie crust and found an interesting book on that subject. I have since returned the book and have forgotten to write down the name of the book and author, so I apologize for not having the name of the cook book. I was looking for a recipe for a crust recipe so I could make a galette. I have never really heard of this dessert before I started blogging. The first time I saw a picture of a galette I thought they were quite unique. So of course I wanted to try to make one. The recipe I found for the crust was buttery and flaky and easy to make. It did turn out to be a little time consuming, but I thought the end result was worth it. I just wanted a simple filling for my galette and decided to go with apples. The focus I thought should be on the crust, not so much the filling for this post. My galette was not as pretty as some of the pictures I have seen of them, but it was very tasty. 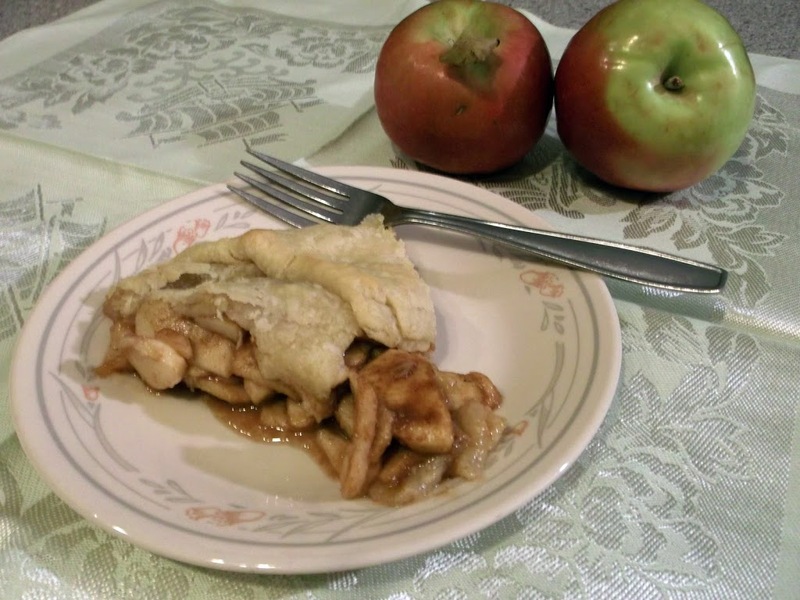 We loved the cinnamon and apples with the buttery crust. Butter: Because the butter is going to be coarsely grated, it needs to be almost frozen, so measure it out, then wrap in foil and place it in the freezer for 30-45 minutes. If it is too soft it won’t grate properly. Sift the flour and salt into a large bowl. Take the butter out of the freezer using a coarse side of a grater and grate the butter into the flour. Take a palette knife or fork and start to distribute the grated butter into the flour. When the flour and butter is distributed completely sprinkle 2 tablespoons of cold water all over continuing mixing with the fork. Finish with mixing with your hands at the very end. If you need a little more water add it to the mixture. Make dough into a ball place in a baggy and refrigerate for 30 minutes. Then roll the pastry out on a lightly floured surface to 1/8 inch. Place filling in center of the crust and fold the edge toward the center of the filling. Preheat oven to 425 degrees F. Bake for 10 to 15 minutes until crust is golden brown and filling is tender. This is a simple filling to compliment the buttery flaky crust of the galette. I love a brown sugar crumbly topping and since this recipe did not include this I decided to add brown sugar to the filling itself. I love making galettes. 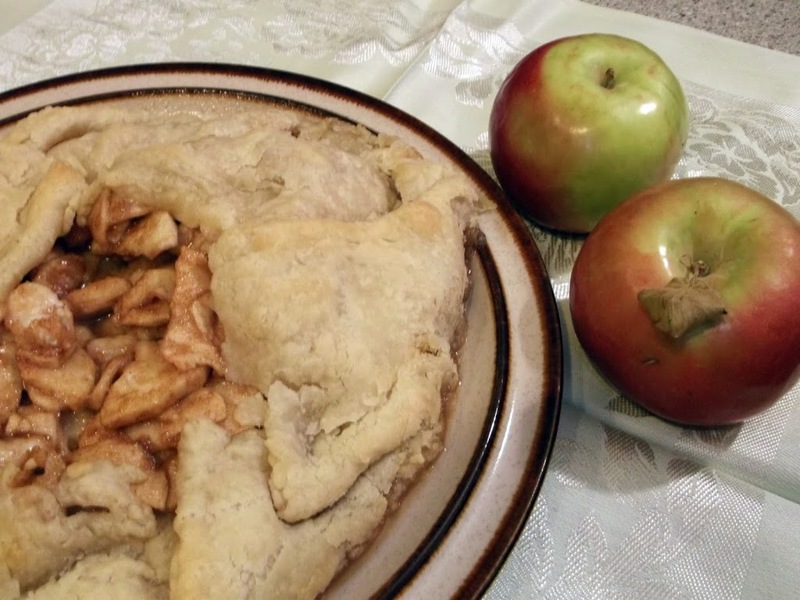 Your apple galette looks wonderful. A perfect autumn tea treat! Great looking apple galette! 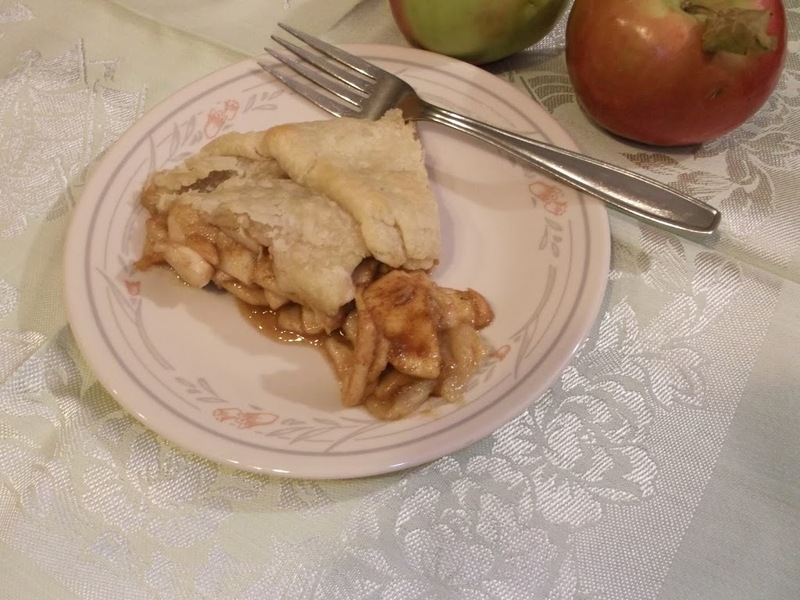 I love all kinds of apple pies!